Part One: Prelude in the dessert. Basel. Vagn Holmboe (1909-1996) is acknowledged today as one of the great composers of the 20th century. His international format emerges clearly in his outstanding series of string quartets and chamber concertos. But in other chamber music too, and in solo and vocal works, a great personality comes into its own with a highly distinctive Nordic sound. Vagn Holmboe would have been 100 years old in 2009. Dacapo celebrates with this collection, which offers rare insight into the composer's musical world. "As an introduction to the world of Vagn Holmboe, this set probably couldn’t be bettered. Be prepared to be delighted." "The performances on this program are universally fine." Prelude: To the Seagulls and the Cormorants, op. 174 no. 6 (1987) 6:51 9,60 kr. I Allegro con brio 9:59 9,60 kr. II Intermezzo I: Vivace 2:39 6,40 kr. III Intermezzo II: Adagio 4:31 6,40 kr. IV Finale: Allegro 4:52 6,40 kr. I. Allegro - 4:39 6,40 kr. Intermezzo I. Tranquillo 0:58 6,40 kr. II. Allegro - 6:12 9,60 kr. Intermezzo II. Affettuoso 1:16 6,40 kr. III. Allegro 3:17 6,40 kr. Molto sostenuto - Allegro leggiero 11:22 12,80 kr. I Præludio. Tempo giusto 5:13 9,60 kr. II Fugare. Allegro risoluto 3:57 6,40 kr. III Introduzione. Adagio - Finale. Allegro giocoso 6:13 9,60 kr. 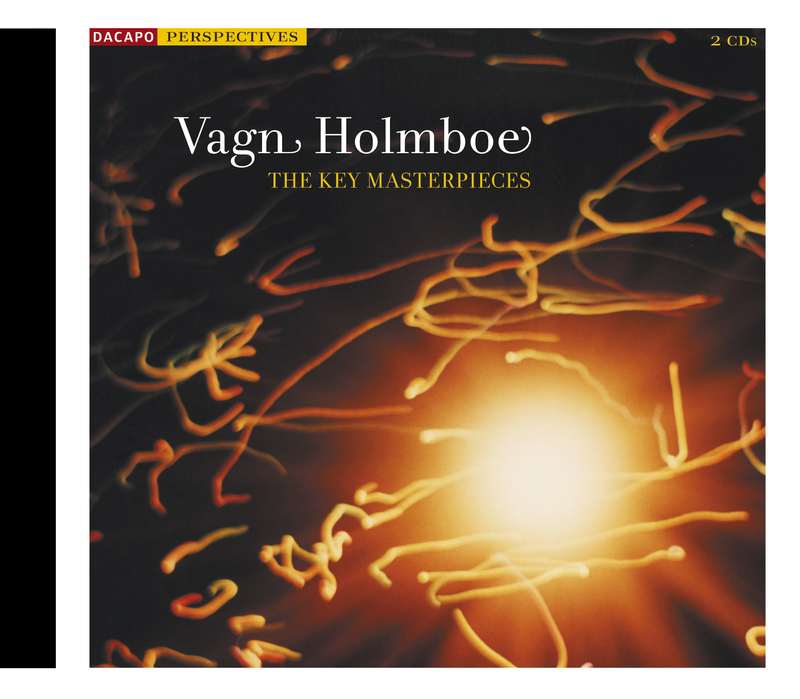 Vagn Holmboe's music is a mixture of thought and nature. It is concentrated and logical, but cannot be reduced to a pure intellectual exercise. For at the same time it has an organic naturalness - the music germinates, grows, blossoms and closes. It develops like a series of metamorphoses following the passage of the sun across the Nordic sky. The mixture of unbounded nature and a sober bridling of the temperament gives Holmboe's music a characteristic duality: asceticism in conjunction with freedom, or as Holmboe himself put it, controlled ecstasy\. A considered, but constantly marvelling view of life. In 1925 Vagn Holmboe was admitted to the Royal Academy of Music in Copen­hagen by no less a figure than Carl Nielsen, who listened to his violin and piano playing and looked through a couple of his earliest compositions. The academy years were typified by studies of the classics and polyphony, a combination that accorded very well with the ‘new objectivity' of the period. This ballast found its counterweight in 1933-34 when Holmboe was in eastern Europe, where he studied the folk music of shepherds and Gypsies. The ultimate purpose of the trip was actually ethno­graphic studies in the Middle East and North Africa, but Holmboe caught typhus and got no farther than Romania. And that was not so bad after all - besides Balkan folk music he also met his wife-to-be, the pianist Meta Graf. The music of the Balkans affected him profoundly. Holmboe's colleague Svend Erik Tarp, who was himself influenced by contemporary French music, remarked: \\We are all fond of Vagn's Romanian folk rhythms from the Horsens area\\ (Horsens is a very Danish city in Jutland). Holmboe didn't exactly change cultures, for it was the expressive­ness of the Balkan music rather than its style that captivated him. \\The direct and emotional, the feeling and the absolutely clear expression - that interested me greatly. There was something elementary in this music,\\ he remembered as an old man. Robust, simple themes are characteristic of his music from the 1930s and 1940s, not least in the long series of chamber concertos (that is, solo concertos with a chamber orchestra) written in the years 1939-56. Chamber Concerto no. 2 (1940) has a flute and a violin as soloists against an orchestra of strings and percussion. It is a sparklingly energetic piece where one hears, right from the beginning of the first movement, the juxtaposition of the insis­tent communal dance rhythms and the playful interweavings of the rhythms and soloists. After the series of chamber concertos was concluded, another remarkable project arose as if in a process of metamorphosis - the four sinfonias for strings. These are condensed ‘chamber concertos' without soloists and can be described as a fourth way among Holmboe's principal genres concerto, symphony and quartet. Sinfonia no. 1 (1957) is an unusually pure work, where not one note is wrong or superfluous in the rigorous duple form. When the last sinfonia had been written in 1962, Holmboe realized that together - in a changed order - they formed a large four-part work which he gave the name Chairos, the Greek word for ‘time' in the psychological, unquantifiable sense. At the end of his life Holmboe created yet another independent series of works, the remarkable Preludes for sinfonietta, where his understanding of nature has bur­geoned in true tone-poems. They are not only descriptive, they are actually dedica­ted to specific natural phenomena. This is ‘ecological' music where mankind must draw back, humbled by the beauty of the trees and life in the water and air. The sixth of the Preludes, To the Seagulls and the Cormorants (1987), portrays both birds and water. The strings flow along as the listener is raised aloft among the gulls and cormorants, which are portrayed by woodwinds. Teeming life which quickly alternates on nature's own terms among all possible kinds of formations. Holmboe returned again and again to Haydn as a model of motivic economy and development. Against that background he wrote twenty string quartets plus the unnum­bered Quartetto Sereno, which he did not finish before he died. Instead it was completed by his most famous pupil, Per Nørgård, to whom Holmboe, forty years earlier, had very touchingly dedicated his Fourth String Quartet. Perhaps no work genre was as obvious a choice for Holmboe as the string quartet, where the asceticism is so to speak built in, and where the polyphony cries out for the metamorphic development in which Holmboe was interested throughout his life. \\It is hardly wrong to say that my First String Quartet (1949) marks a kind of turning-point or a development point. I was prepared for it, but suddenly it broke loose,\\ Holmboe recalled shortly before his death. The series of string quartets makes Holmboe one of the twentieth century's most significant composers in the genre. His quartets span almost fifty years and as a work series can be compared to those of Shostakovich. The Fourth String Quartet (1954) is an outstanding example of the strength, rigour and natural power of his quartets. It is in itself a metamorphosis of an unfinished sonata for solo violin on which Holmboe had worked previously. In general, chamber music is a truly prominent element in Holmboe's creative out­put. He wrote over a hundred chamber works, and with inspiration from individual musicians he gradually accumulated works for a wide selection of instruments. The Solo Sonata for Cello (1969) is an impressive work that bears comparison with Kodaly's watershed sonata from the beginning of the twentieth century. Rarely has Holmboe used such dramatic gestures and made such technical demands on an instru­men­talist. Nuigen (1976) is Holmboe's second piano trio, and that is the explanation of the mysterious title (‘Now again!'). Written more than twenty years after the First Piano Trio, it demonstrates Holmboe's quite amazing vitality and his persistent ability to extract the essence of folk music. The three main movements and their insistent opening theme are put into relief by two intermezzi which, with their quite different ‘sacred music' style, have the effect of philosophical reflections. On very few occasions this quiet, friendly composer wrote music in the monumental style, where the sheer size towers up. The oratorio Requiem for Nietzsche (1963-64) is in that sense an exception: an all-at-once work, unlike his endeavours, for example, with string quartets or solo concertos, which he repeatedly explored for new possibilities. This helps to make the Requiem one of Holmboe's strongest and most challenging works. The Requiem is a portrait of Nietzsche, based on the Danish poet Thorkild Bjørnvig's sonnets reflecting on Nietzsche's dramatic progress from profound per­ceptions to absolute madness. As an oratorio it is without Baroque pastiche, but it is full of passion and shock effects, in the instrumentation and in the actual musical dramaturgy - yet always with full support in the material and never as histrionics. Vagn Holmboe's fundamental sincerity was not to be denied.